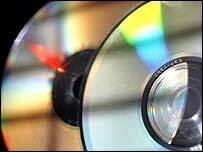 CDs, DVDs, and video games in the US are to get an FBI seal in an attempt to deter people from copying them. The new labels warn consumers that criminal copyright infringement could land them with a $250,000 (£133,000) fine and five years in prison. They each carry the seal of the FBI, which says piracy is now its third biggest priority behind terrorism and counter-intelligence. US entertainment firms says they are losing billions of dollars to piracy. "The theft of copyrighted material has grown substantially and has had a detrimental impact on the US economy, said the assistant director of the FBI's cyber division, Jana Monroe. The FBI said it was up to individual companies whether the label appeared on the packaging, or on screen. The full warning reads: "The unauthorised reproduction or distribution of this copyrighted work is illegal. "Criminal copyright infringement, including infringement without monetary gain, is investigated by the FBI and is punishable by up to five years in federal prison and a fine of $250,000." The label has the backing of the Recording Industry Association of America (RIAA), the Motion Picture Association of America (MPAA), and two groups representing the software industry, the Entertainment Software Association and the Software and Information Industry Association. RIAA executive vice president Brad Buckles said: "As the seal attests, these are serious crimes with serious consequences - including federal prosecution - to making unauthorised copies or uploading music without permission, and consumers should be aware of them." Last year the RIAA filed hundreds of lawsuits through the US courts against individuals it accused of swapping music online. MPAA senior vice president Ken Jacobsen said the film industry was losing $3.5bn (£1.86bn) each year through piracy, before copying via the internet was taken into account. "With hundreds of thousands of jobs at stake nationwide, piracy is a serious threat to the entire entertainment industry," he said.